Chef Joseph Go, Sta. 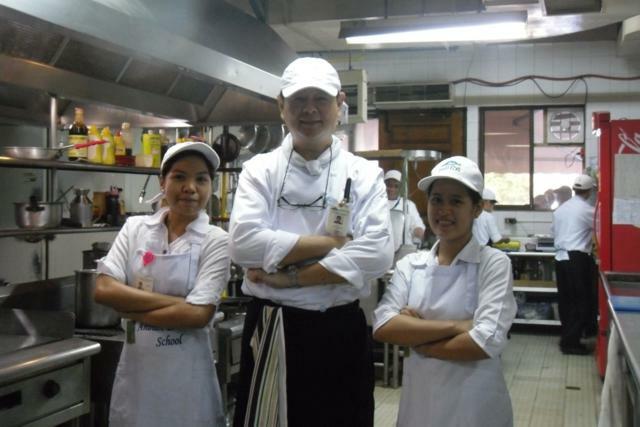 Elena Golf Club Executive Chef, recently expressed his praises for the Anihan Scholars doing their on-the-job-training (OJT) in the exclusive golf club located in Canlubang, Laguna. 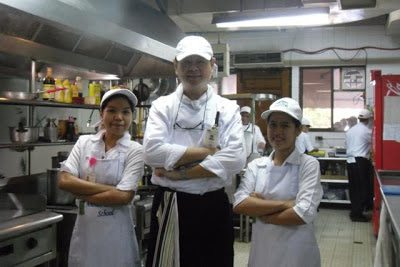 In particular, he told Anihan's Training and Alumnae Coordinator, Maria Senen Olmos, that the two Anihan scholars assigned in the kitchen are doing very well... They are able to cook and prepare our menu dishes. They are both fast learners and have very good team spirit. Words cannot describe how happy I am and how lucky we are to have both of them training in our kitchen. They are very hardworking. with Anihan Scholars Relen Siman (left) and Jarmaine Arambala (right).